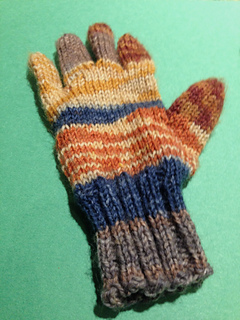 Finished glove is about 5 (6, 6.5) inches/12.5 (15, 16.5) cm around the palm and about 7 (7.75, 8) inches /18 (19.5, 20) cm long to end of middle finger. 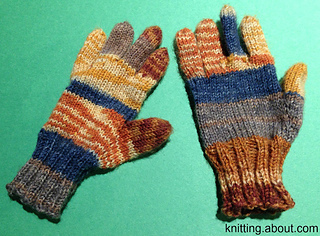 These basic gloves are worked with sock yarn and are great for kids. Note: About.com no longer exists and many patterns have been deleted. This one is still available through Internet Archive: http://web.archive.org/web/20150406185558/http://knitting... but you might want to print it out for your records.